This oceanfront high-rise condominium offers air-conditioned units and private lanais with sweeping ocean views for watching the sunset and the whales at play. Each studio, one- and two- bedroom unit boasts a spacious living area. It's easy to feel far away and perfectly content in your own private world. Parking is complimentary. Oceanfront in Kahana, 5 minutes north of Kaanapali. 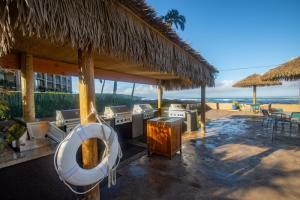 50 minutes from Kahului Airport and 3 minutes from Kapalua Airport. 8 miles north of Lahaina.